Tags: Frisbee Revolution, Kent State, Michael Winship, Moyers & Co. This article originally appeared at readersupportednews.org. Thinking I’d write a piece on the 45th anniversary of the deaths at Kent State, I realized I’d already written it – five years ago. There’s not a lot I’d change in this, although there’s some comfort in the knowledge that unemployment has dropped from the 9.9 percent of 2010 cited below. In retrospect, my memory of the weeks after Kent State is tempered a bit by the recent recollection that when I, too, finally went home that summer – what little cash I had ran out – I volunteered with a local peace group collecting signatures on a petition in support of the McGovern-Hatfield amendment in the US Senate that proposed cutting off funds for the Vietnam war. I was stunned and delighted by the degree of anti-war sentiment and activism in my then conservative hometown. Further, unlike the seeming conclusion of a recent public television documentary on the events around Kent State, I don’t feel that the murders completely took the wind out of the anti-Vietnam movement or scared students away from speaking up. 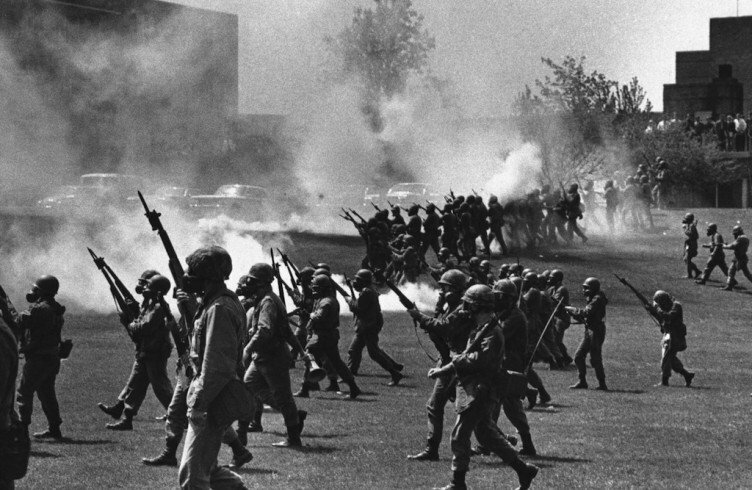 Less than a year after Kent State, for example, 200,000 returned to the Washington Mall and US Capitol to protest the war, and a week later in DC, more than 12,000 were arrested in a more violent series of May Day actions. It’s believed to have been the largest mass arrest in American history. As for the post-Obama election apathy, recent events have given me some hope – witness the community activists participating in April’s Populism2015 conference in Washington and the various sources of inspiration for them and progressives all over the United States. Nonetheless, indifference is still immense. Last year’s midterm turnout was the lowest for a general election in 72 years and as Rep. Keith Ellison, co-chair of the Congressional Progressive Caucus points out, while voter participation for those making $150,000 or more a year was 80 percent, for those making less than $150,000, the percentage was 35 percent. I was a freshman at Georgetown University when it happened, 40 years ago on May 4. Most of us didn’t know what had taken place until late in the day. We were in class or studying for finals, so in those pre-Internet/cable news days, hours went by until my friends and I heard. On that warm spring Monday, the Ohio National Guard had opened fire on an anti-war demonstration at Kent State University and four students lay dead. Nine others were wounded. It took a while to sink in. This was the sort of thing that happened in South American dictatorships – young protestors gunned down for speaking out against the government. Not here. Then I remembered that some of my high school classmates were at Kent State, a campus fewer than 250 miles from my western New York hometown. But I had no phone numbers for them; there was no immediate way to find out if they were safe (they were). The details were hazy and slow in coming. That night, friends huddled around the tiny TV I had in my room — one of those early Sony tummy tubes with a fuzzy, black and white picture the size of your palm. With each sketchy report, anger and frustration grew in the room but didn’t start to go over the top until, believe it or not, The Tonight Show came on after the 11 o’clock news. Johnny Carson’s guest was Bob Hope, and when the then-sexagenarian comedian launched into what was his standard routine those days — lots of jokes about long-haired hippies and smelly anti-war protesters — the kids crowded into my tiny dorm room were furious. On this of all nights how could he be so crass as to trot out those tired one-liners about, well, us? By the next morning, groups of students gathered around the campus taking about Kent State and the events leading up to the killings. A few days before, President Nixon had announced the invasion of Cambodia, justifying the so-called “incursion” as necessary to protect our troops in Vietnam. Protests had broken out at schools all over America. With the Kent State deaths, we wondered what to do — and what would happen — next. A crowded meeting in the school’s main assembly hall lasted late into the night, filled with the earnest bombast of callow youth and plans of action that ranged from Do Nothing 101 to Advanced Anarchy. The bookstore’s stock of Georgetown t-shirts sold out as kids scooped them up and stenciled defiant red fists on the backs. My friend Romolo trimmed his red fist in green, a gesture of Italian-American solidarity. By mid-week, two parallel strategies emerged: a national strike that would shut down the country’s colleges and universities — both as a protest and to give students the freedom to devote all their time to mobilizing against the war — and a massive rally in Washington, DC, on Saturday, May 9. As did approximately 450 American schools, the Georgetown administration yielded to the strike. We were given the option to finish finals or take the grades we already had for the semester. We went to Capitol Hill and tried to see our hometown members of Congress to let our opposition to the war be known, then turned our attention to the big Saturday rally. Because we were already in DC, much of the logistics fell to us and the other colleges in town. I volunteered to be a rally marshal, directing crowds and hoping to prevent violence. On the main campus lawn, we were given a crash medical course in how to cope with dehydration, tear gas attacks and gunshot wounds. At breakfast Saturday morning, with macho-laced concern, we asked our girlfriends to stay away from the rally; there might be trouble. Instead, we suggested they go to the protest headquarters to help out. As it turned out, they wound up in more danger than we were — a small group of neo-Nazis attacked the rally offices. Luckily, no one was seriously hurt. As for me, I was given a powder blue armband and stood with other marshals on the periphery of the 100,000 person rally, enjoying a lovely sunny day. For its protection, the White House had been ringed with DC Transit buses parked nose to tail. Later, we’d learn that members of the 82nd Airborne were camped out in the basement of the Executive Office Building. Nothing happened until late in the afternoon, when an army water truck came barreling toward us and we linked hands, as if somehow that would ward it off. In fact, the truck veered away just before it reached our paltry line of defense. In the next day’s paper, I read that the vehicle had been hijacked by Yippies and was last seen racing across a Potomac River bridge into the wilds of Virginia. And then it was over. That night, rumors spread that police were going to clear out groups of out-of-town demonstrators who were camped out in Potomac Park near the monuments and that they would flee to the college campuses. We stayed up all night waiting to take them in but it never happened. On May 15, two more students were killed and 12 wounded at Jackson State University in Mississippi, with nowhere near the attention Kent State received. The Jackson State students were African-American. The mobilization that was supposed to continue with the close of school fizzled out. Most Georgetown students took advantage of the early end of the semester to bask in the sun and play on the lawn or simply go home. A friend wrote an editorial in one of the campus newspapers headlined, “The Frisbee Revolution.” Those of us who were trying to keep the protests alive were annoyed at the time, but he was right. Once the impetus of the big rally was over, motivation vanished and kids went back to being kids. The war retreated, out of sight, out of mind. But it went on – with and then without American troops — for another five, bloody, futile years. Despite all the anger and worry today: an economy in shambles; the loss of jobs and security; wars continuing in Afghanistan and Iraq; and a dysfunctional government hobbled by the stranglehold of campaign cash and political hackery, there’s a similar lack of interest afflicting many of those of those who rallied to the cause of Barack Obama in 2008, knocking on doors, contributing money — voting. With that exciting and historic election over and done, the attention of many of them wandered elsewhere, consumed by self-interest or distracted by media’s oxymoron, reality TV, where ex-astronauts dance with chorus girls and parents juggle eight children under the omniscient gaze of the camera. Friday’s edition of the Financial Times was headlined, “US shares tumble amid fears over debt,” but also featured a glossy magazine insert titled, “How to spend it.” Options include a Kevlar racing kayak, a game darting safari in Kenya and a white gold lace bracelet with diamonds and rubies, a steal at $220,000. On the same day came word that US unemployment for April hit 9.9 percent, despite a reported 290,000 new jobs. Last week, thousands marched on Wall Street to protest the cynical abuse for profit perpetrated by banks and corporate America. On May 17, others will march on Washington’s K Street, where lobbyists roam, not free, but in pursuit of princely paychecks from those who seek influence and clout. Meanwhile, in the great American elsewhere, the Frisbees are flying.